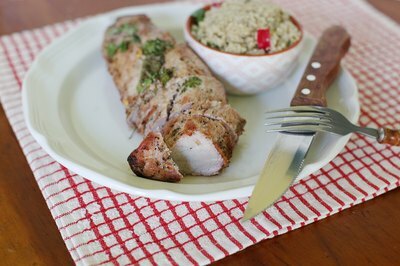 Pork loin, also known as pork fillet or pork tenderloin, is a lean cut of meat. However, coming from the back and side of the pig — running the length of the body from the hip to the shoulder — it is also a very tender cut of meat. To keep your pork loin moist, do not overcook or over-trim the loin. Marinating and brining not only boost the flavor of this mild-tasting meat, they can also increase the moisture content, minimizing the chances that you end up with dry, cardboard-textured pork. Pork loins contain little to no fat or connective tissue inside the loin muscle. Because of this, the meat is very lean and is prone to becoming tough when overcooked. However, pork loins, with their long, tubular shape, do have a “cap” of fat over the loin. While this fat is often trimmed to be minimal or nonexistent in grocery stores, you can sometimes find the fat attached at a specialty butcher. When trimming at home, leave at least 1/4 inch of fat on your tenderloin, as the fat will baste the loin during roasting, keeping the meat moist. Marinating or brining pork loin increases the flavor and the moisture in the loin. To marinate the loin, use a mix of oil, acids and spices and herbs to season. The acid, such as vinegar or lemon juice, breaks down the muscle fibers, increasing tenderness. The oil adds fat to the lean cut of meat, and the herbs and spices add flavor. 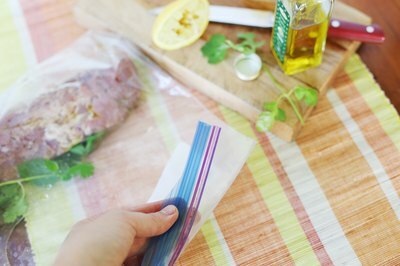 Marinate your loin for a minimum of 20 minutes to overnight in a sealed plastic bag to give the flavors time to penetrate the meat. Brining a pork loin is similar to marinating one. Submerge the loin in a mix of water, dried spices and a large quantity of salt, and some sugar. You can also add acid if you like. However, brining requires more time than marinating. For a whole pork loin, plan on keeping it in the brine, in the fridge, for 2 to 4 days. Pork loin, as a lean cut, benefits from a high cooking temperature to ensure that it cooks quickly but has time to develop a sear on the outside, giving the meat extra flavor. Preheat your oven to 450 degrees Fahrenheit, and heat a heavy-bottomed, ovenproof pan on the stove top with oil covering the base of the pan. When the oil is shimmering, place your pork loin in, quickly searing on all sides before moving the pan into the hot oven. Roast for roughly 10 minutes per 1 1/2 pounds of meat. Another option is to slow-roast the loin to keep it more moist. The lower temperature in the oven does not cause the muscle fibers in the meat to seize as much during cooking, producing a roast that is more tender, and juicier. After searing, slow-roast the loin, uncovered, in a 250 F oven for 20 minutes per pound. Pork tenderloin is safe to eat when the internal temperature reads between 145 F and 160 F. A quick-read thermometer is the only way to ensure that a precise temperature reading is made. At 160 F, the traditional temperature, pork loin is fully white and a little dry, although brining and marinating will help preserve moisture. At 145 F, the loin will be pale but slightly pink and very juicy. Let the loin rest for 10 minutes to redistribute the juices before slicing and serving. To keep the loin very moist, undercook pork loin slightly, by about 5 to 10 F, as the loin will continue cooking while it rests.